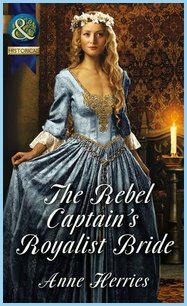 Orphaned and without protection, Babette Harvey must suffer in silence when her uncle gives shelter to a band of Rebels - though her Royalist blood boils! But other dangerous passions must also be quieted - including those aroused by the handsome and commanding Rebel leader Captain James Colby. When Babette's talent for herbal medicine attracts suspicions of witchcraft she has nowhere to turn save to Colby - her honourable enemy. And with the Captain determined to claim her as his bride Babette must choose which to betray - her principles or her heart.